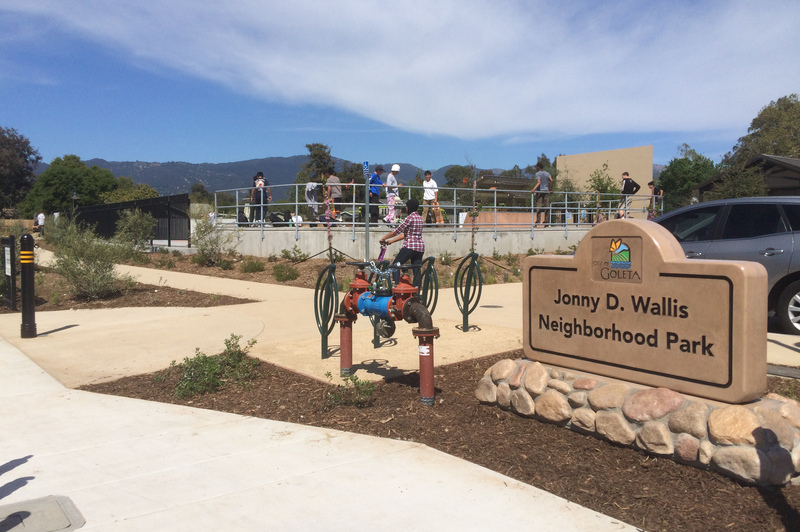 Jonny D. Wallis Neighborhood Park opened March 30 after a quick 10-month construction period and long 13-year wait. A pair of parents laughed as they tried out the exercise equipment at one corner of Goleta’s newest park, while their kids seemed bemused at the sight of their parents messing around on a stair stepper. Another family picnicked next to San Jose Creek on the black-topped bicycle path, a short piece that will one day connect the beach bikeway to Calle Real, on the other side of the 101. It was Saturday afternoon at 170 South Kellogg Avenue, four acres of land that narrowly escaped capture by the state Redevelopment Agency boondoggle, on the first day it officially transformed to the Jonny D. Wallis Neighborhood Park. “No one would have been happier to see the new park opening,” said Kitty Bednar, Wallis’s longtime partner. “Jonny would have been the first to thank everyone who worked so hard to make that possible.” Wallis, voted onto the city’s first council in 2002 and one of the city mothers, had advocated for Old Town parks, gaining Armitos Park during her 45 years in Old Town before her death in 2013. The skateboarders were clattering up and down the skate-park ramps, executing a flourish as they screeched up to the railing. One teen confided they’d been there all week, checking it out. Over at the play structures, parents leaned in taut alert, watchful over their toddlers and youngsters. Everyone was staying off the soccer field, either to give the newly rolled-out sod time to take root (that’ll take a couple weeks) or because of the multitude of other things to do at the park. Earlier that morning, Mayor Paula Perotte had thanked the city staff who’d taken the park from dirt to playing fields in 10 months and the many in the community — including those who voted in the “name the park” contest — who’d contributed ideas to the park’s design. She included State Senator Hannah-Beth Jackson and Assemblymember Monique Limon in her thanks; they had helped the city successfully get the rights to the land. The city’s Redevelopment Agency (RDA) had bought the land in 2011, but the state dissolved RDAs the next year. It became the state Department of Finance’s decision to determine ownership, finding in Goleta’s favor in January 2018. The new park contains not only a trickling creek and the Sister Witness Tree, the largest California sycamore in the world, but tennis and basketball courts, bocce and handball courts, a Ping-Pong table and picnic tables. Shade, sun, and grass are slated to be joined by a splash pad in the future.